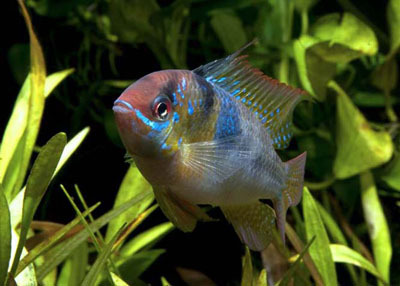 Valley Fisheries, is credited with developing the German Blue Ram (GBR) in the early 1990’s. Originally indigenous to Colombia and other parts of South America, the GBR (scientific name: Microgeophagus ramerizi) is a strain of Dwarf Cichlid that was exported to Germany in the 1950’s. These fish were kept in Germany by a small group of advanced hobbyists. Over the years the strain was selectively breed for a bigger fuller body, taller dorsal fin, and brighter blue body. These fish were never available to the average person because the German hobbyists were unable to breed mass quantities due to complex breeding issues. In the early 1990’s this strain of Microgeophagus ramerizi kept in Germany were completely wiped out to a disease. Months before the disease, Valley Fisheries imported the healthy Microgeophagus ramerizi from a German breeder who was afraid the strain would be lost. Valley Fisheries immediately began working on perfecting the breeding program so they could expand these fish to the American Market. For a period of time after the fish in Germany were lost, Valley Fisheries was the only fish hatchery in the world where the strain was maintained. Several months later Valley Fisheries introduced the German strain of the Microgeophgus ramerizi fish to the tropical fish retail industry under the new common name, German Blue Ram.